SSDP's Campus Campaign leverages the attention, excitement, and advocacy opportunities associated with ballot initiatives and other drug policy reforms, providing us with with unique opportunities to connect with students on campus and introduce them to the power of changemaking while substantially contributing to major policy reforms. Update 2/28/15: Thanks to you, a committed donor from California has matched the first $50,000 you gave to support the 2015-2016 Campus Campaign! That means we’re launching our wildly successful Campus Campaign in July when we hire the first Campus Coordinator to expand our network and get out the youth vote in key states in preparation for 2016. 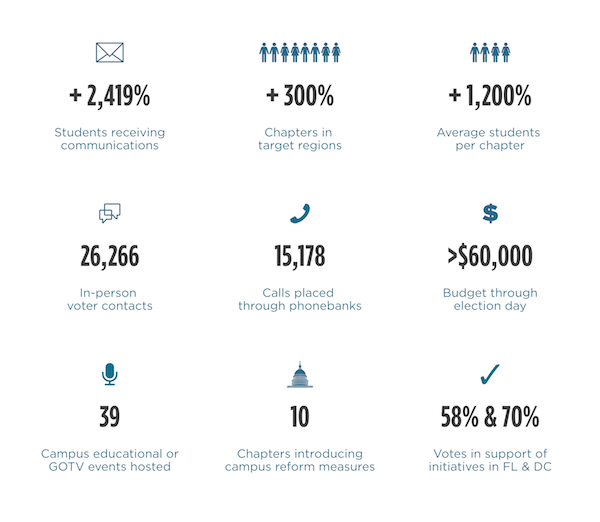 But that’s just the beginning: if we are able to fully fund this campaign by December 31, 2015, six Campus Coordinators will be working across the nation to ensure that the reforms we’ve been fighting so hard to achieve continue to expand — bringing justice, compassion, and sensibility to more and more states through youth- and student-centered action. We've updated the goal below to reflect the next benchmark we need to meet before we can start planning to support chapters with our second Campus Coordinator, and we'll keep updating as we go. Help us get there by sharing a post on Twitter or Facebook.